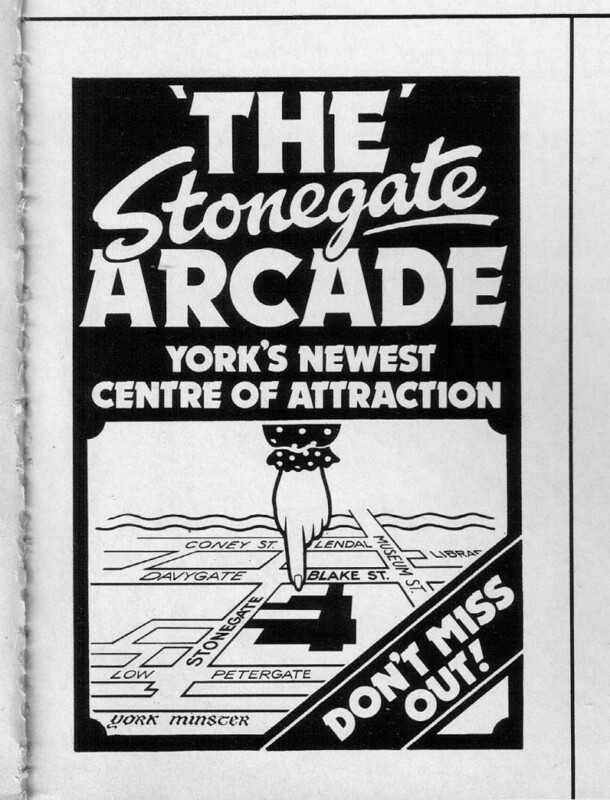 The adverts in an early 1980s guide to York featured on these pages a while back included an ad for the Stonegate Arcade. 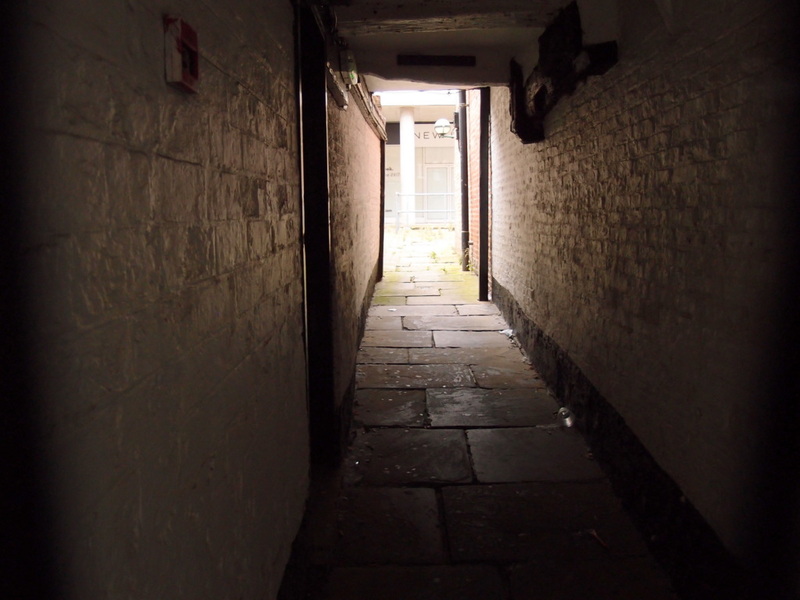 I couldn’t remember much about it, or where its entrances were, but recently had a wander down Stonegate and peered through the now gated openings, which I must have passed many times over the years and never given much thought to. The ironwork gates at the entrance show that it’s called ‘Stonegate Walk’, though you can’t walk down there now, as the gates are always closed. 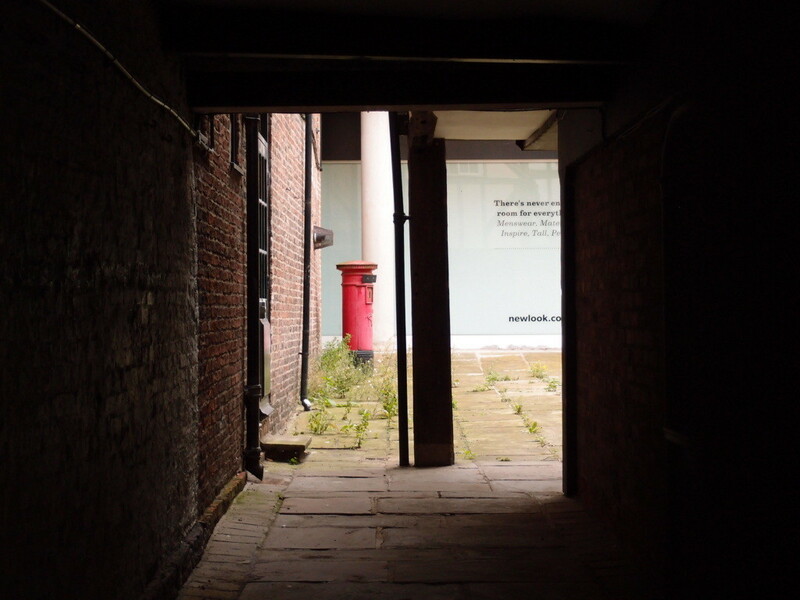 One has a nameplate still — Hornby’s Passage — and looking down it gives a glimpse of the back of the large New Look clothes store, the entrance of which is round the corner on Davygate, perhaps across what used to be the other entrance to the arcade, shown on that ad from the 1980s, above. 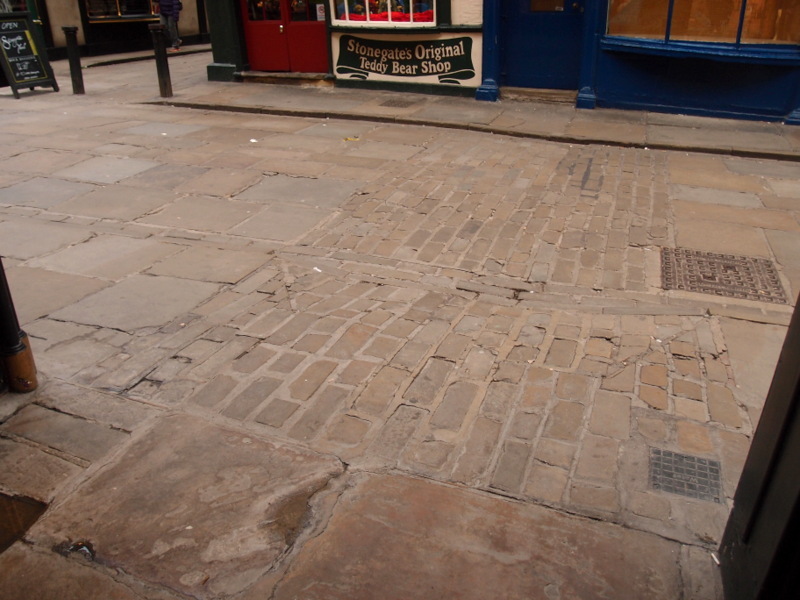 Though the entrances are gated now and the arcade is long gone, the paving detail on Stonegate still points to it, with lines of narrow setts breaking up the otherwise stone-flagged surface, subtly denoting the entrances. Something I’d never noticed before, a detail used in other places on Stonegate to mark the entrances to other narrow alleys off the main street. A forgotten post box, in a weedy corner. A reminder that this was once a thoroughfare thought important enough to have a post box. Its posting slot is sealed and the information on the times of the next collection is long gone. I wonder when its last collection was, and if anyone noticed. There’s something a bit poignant about its sealed-up state. I wonder why it has been left there, faded and forgotten. On the wall of the passage there’s still an iron fitting which presumably once held the gate back, in the days when we could walk along here to go shopping in Stonegate Arcade. I did a bit of online research on the arcade and its successor, this ‘Stonegate Walk’, neither of which I particularly remember. There’s a lengthy list of links below, in ‘further information’. 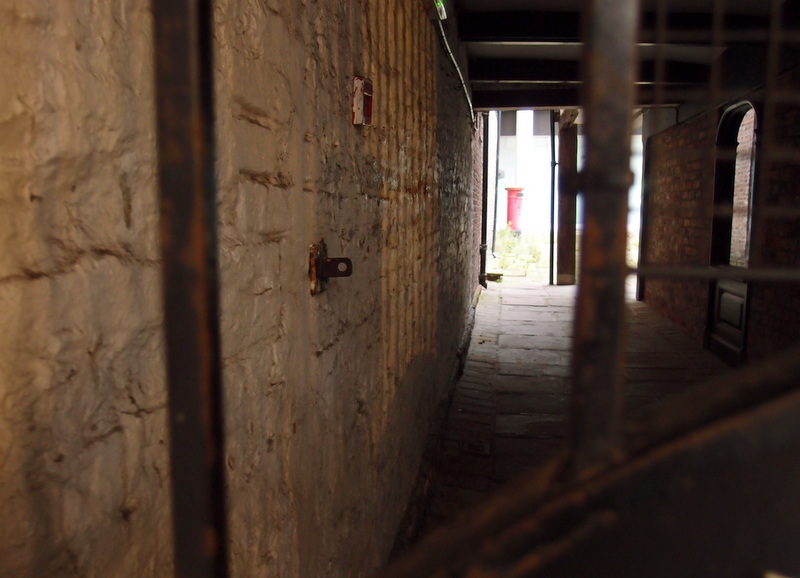 “… to the entrance to Pinder’s Court. Not that you would see that name here: the sign says Stonegate Arcade. But this is only the collective name for a new collection of Snickelways, a creation that excitingly and satisfyingly blends old and new. Walk up the passage into a little courtyard, and you unexpectedly see the Minster, framed by a spacious glazed canopy. Look back, and you are greeted by a back-door view of Stonegate and its roofs – the deliciously random yet harmonious pattern of medieval buildings, with which we’ve become familiar in our nearly-completed wanderings. For Pinder’s Court, and its parallel companion Hornby’s Passage, which are at the heart of the Stonegate Arcade, form a happy and fitting penultimate to our list of fifty Snickelways. In their case, the surprise is that not so many years ago, this attractive area was the dank, dark, oily and echoing City Garage. 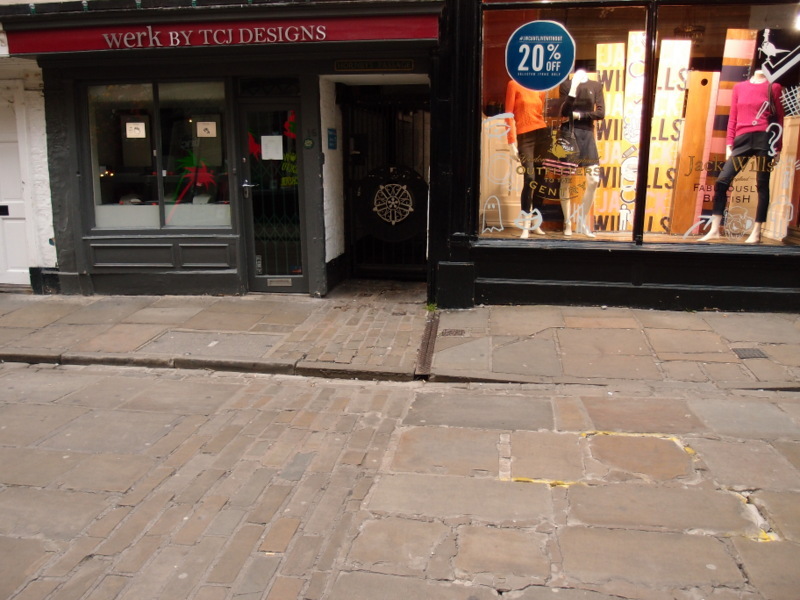 How many more ancient Snickelways lie behind York’s shop-fronts and warehouses, awaiting re-discovery and re-birth? That last paragraph tactfully hints at some problems with the arcade’s commercial viability. Around the same time, the Architects’ Journal put it more bluntly: ‘York’s Stonegate Arcade has been branded as a commercial failure and is unpopular with shoppers’ (source: Google Books), and mentioned plans to boost its fortunes with a new development scheme. The project finally brings to an end the “white elephant” tag for a mall where much of its 20-year history has been plagued by empty shops because shoppers in Stonegate and Blake Street tended to pass by its connecting alleyways. If you have memories of the Stonegate Arcade, please add a comment. I was involved with Stonegate walk from 1992-1995 when I worked at DTZ who managed the centre. We arranged all sorts of activities and had no empty shops by 1995. I did some research which I think went into an advert in the Evening Press. The snickelway names have a connection to the area and families who lived on the site. There was also a piano factory on the site called Waddington and Sons. Nice to see the information above added to this page, thanks Drake and Marc for your memories and knowledge. I can remember the Stonegate Arcade vaguely. There was a clothes shop called Cloud Nine which I think was near the Stonegate entrance. The only other one I can remember was Naf Naf which was either in the New Look shop or in that sort of area.